Approved accessories for the Commer Cob Series 1 1958. Homepage. This page: The extensive list of optional equipment available to buyers of the Cob Series 1 in 1958. Commer Cob Series 1 Special Accessories list. Material relating to classic vans is sprinkled across the Old Classic Car site, given that a) many small vans relate closely to their saloon car brothers, and b) I like them. A number of classic van options are described in the Classic Vans and Pickups section, while photographs of vans in period, and in preserved state today, are also numerous across the site. 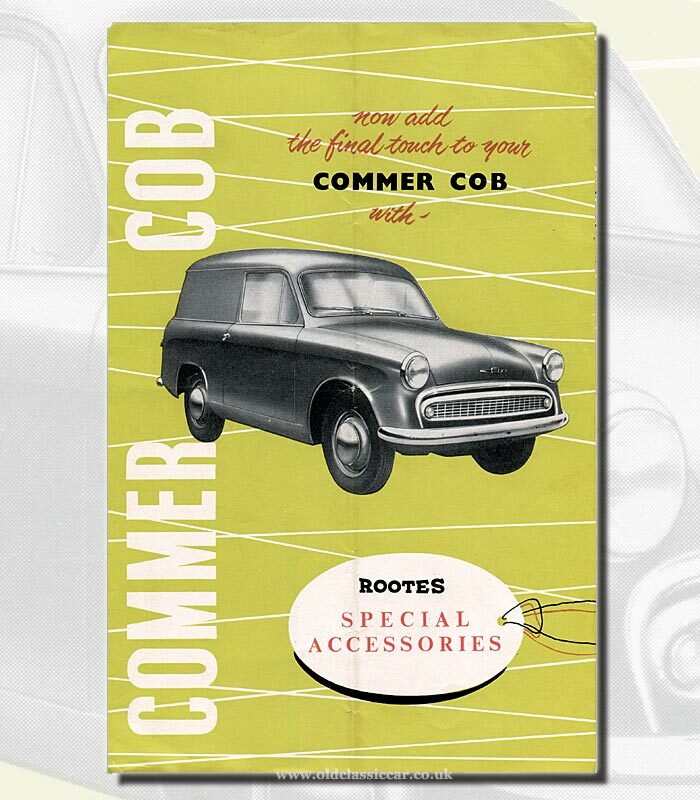 This page looks at the Rootes Group offering in the small, 7cwt, van sector, in the late 1950s - namely the Commer Cob, here in Series 1 (not Mk1) guise. Or to be more precise, the list of official accessories that were offered to buyers of new Cob vans in 1958/9 by Rootes Group dealerships. Vans in the 1950s were pretty basic affairs, usually devoid of anything that could be referred to as a "creature comfort". Passenger seats, sunvisors, heaters, bumper overriders and even rear view mirrors, were often not to be found on the standard build sheet. Many companies didn't even offer them as an option, their buyers having to turn to aftermarket suppliers to plug the gaps in their vehicles' specifications. This is why I'm a little surprised just how many optional extras were made available to buyers of the Commer Cob. By making these items "Special Accessories", as Rootes called them, the list price was pegged right down in what was quite a competitive market. After all, no-one - especially a canny business man or woman - wanted to shell out their hard earned pennies on gadgets and gizmos that they had no use for. In the 1950s, many vans were purchased by private individuals who, rather than opt for an estate car, instead chose to buy a new van (there were tax incentives in so doing). Once home, out would come the tin snips and apertures for windows would be let into the van sides. With this in mind, these van buyers may well have been tempted by the many accessories on offer to them at the time of purchase, with one eye to the future when the van would be transformed into a compact estate car. The publication isn't dated, but presumably it dates to 1958 which was the launch year for the Hillman Minx-based Cob Series 1. The cover features a plain, bog-standard, van, waiting to be spec'd up with the mouthwatering array of options that would be revealed overleaf. 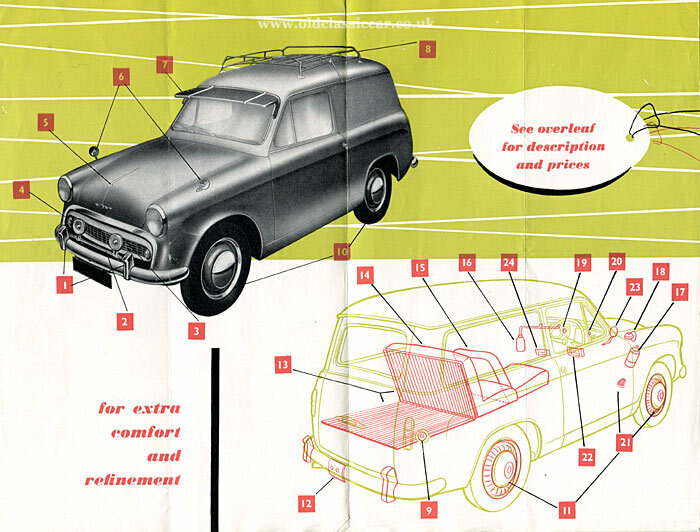 Opening the leaflet reveals a much-transformed Cob, along with a diagram which combined together illustrates the extensive list of goodies that you could have equipped your van with. Each upgrade is numbered, with a key provided on the reverse side which is listed below for reference. This may come in handy for anyone restoring a van who wants to upgrade their van, but only with items offered in period by the manufacturer. In 1958, buyers would simply place a tick alongside whichever accessories they wanted, handed it to the supplying sales agent, and await delivery of their new vehicle. O/S mirror fitted as standard on all Home market models. Sadly, the option to have any form of extra rust-proofing applied at the build stage wasn't offered. As a result, vans (whether from Commer, Austin, Morris or whoever) didn't last all that well, and survivors are decidedly thin on the ground. Add in the abuse that vans often receive, especially when compared to their saloon counterparts, and it's surprising that any survived. Those that have made it into the 21st Century, are much-prized possessions now. More period items relating to old vehicles can be found in the Motoring Collectables section of Old Classic Car. Use of the site search for your favourite make and model of van will probably bring up at least one page on the subject. Here for example, you'll find a page for the slightly larger Commer Express Delivery Van. Two period photographs of a Series 1 Commer Cob can also be found on this page, within the photographs section.